In 1994 I combined family holidays (Black Hills, Mt.Rushmore, Badlands Nat'l Park, Sturgis Biker Festival, Yellowstone Nat'l Park) with a visit to Hawkins & Powers, located rather remotely at Greybull, Wyoming. As I came unannounced, my request to photograph H&P's aircraft, was frowned upon. But a quick clarification of my interest was smilingly ("a bit weird" could be read in their eyes, I thought) accepted. With a "sure, go ahead, mind the snakes out there..", I was allowed on the ramp and in the desert storage area. This Consolidated PBY4 Privateer is a real dinosaur ! Who could have believed this product of the 1940s would still be around in the 21st Century... active ! Hawkins and Powers have 5 still on active duty. This one here is N7962C (c/n 59882), Tanker 126. The PBY4-2 Privateer was a development from the World War II bomber B-24 Liberator and was intended for long-range coastal patrols. It had a range of 4.500 kms, cruising speed 225 km/h and saw service with the U.S.Navy and the French Navy. 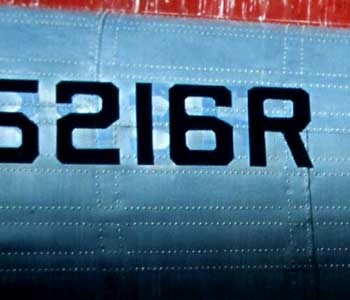 Some 736 were produced and first entered service in 1945. Crews nicknamed it "Two-by-Four". The Privateer was also used for "spy-flights" during the Cold War. In fact, when in April 1950 Russian MiG-15 fighters shot down a PBY4-2 over the Baltic Sea, it was the first victim in a war of "electronic surveillance" that would last 30 years. Joe McAdams, who flew PBY4s for H&P (Tanker 126 during the 1974 fire season and PB4Y Tanker 127 during the 1975 season), volunteered the following information on the engines: "The PB4Y Privateer originally had Pratt and Whitney R-1830 engines, but all the tankers operated by H&P were converted to Wright R-2600's for fire suppression. This was an "in house " modification designed by Gene Powers. 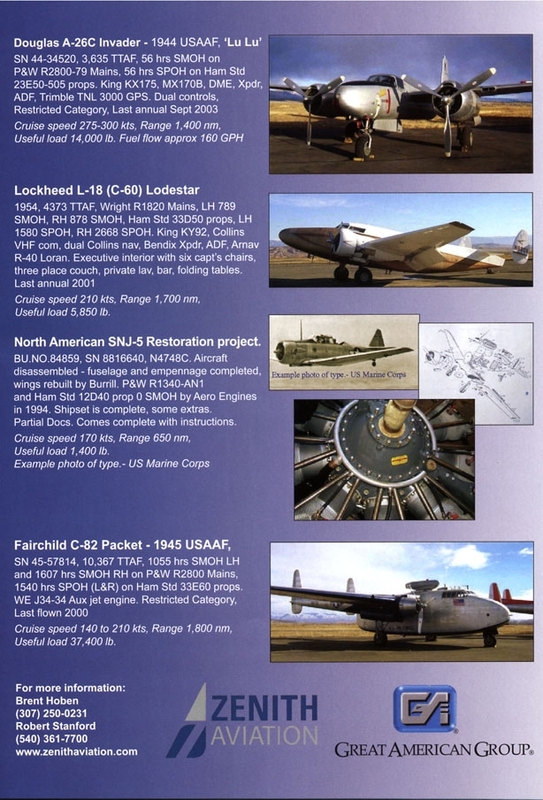 The R-2600 engines were the same used on the North American "Mitchell" B-25.."
N130HP (c/n 3146) is a Lockheed C-130A Hercules, formerly operated by the US Air Force as 56-0538. Even though it's over 30 years old, it's the most modern equipment with Hawkins & Powers (and with most airtanker companies). Tanker 130 sat here on the ramp to get some maintenance done; the pilot was anxious to get back to his station of contract as his family had just flown over to spend some time with him and now he was back in Wyoming ! Airtanker crews will spend months away from home, as far away as Alaska, to cover the dry season on contract to (e.g.) US Forest Service (USFS). 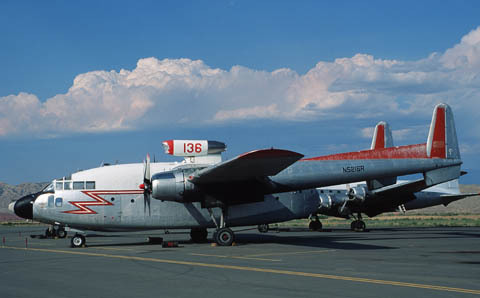 Tanker 130 and its 3-crew met its fate on June 17th, 2002 while fighting a fire at Walker,Nevada; for more details: Tanker 130 down !!! Lockheed C-130A Hercules N133FF (c/n 3143) is used as spareparts supply source. In later years it were the tyres (to keep it down in gale force winds ?) 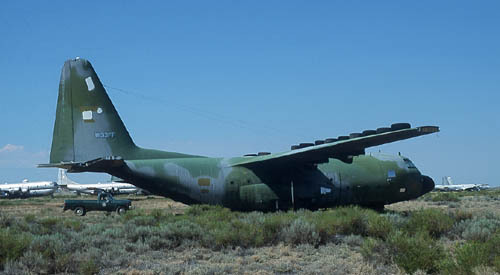 which identified this Herc as they took of the tail and the registration with it. With the USAF it was registered as 56-0535. Have a look at a photo Ralph Pettersen sent me, taken in May 2003. 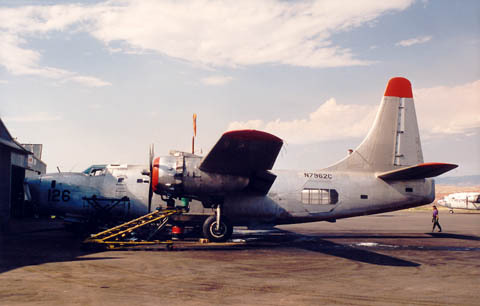 Another former Navy patrol aircraft popular with the airtanker industry is the Lockheed Neptune. As you can see H & P have quite a few lined up as spare in their backyard (a bit of desert, where I was still a bit jumpy because of that snake warning they'd given me previously..!). The Lockheed P-2V (redesignated P-2 in 1962) was used in large numbers by the US Navy during the first half of the Cold War, to fight the threat of Russian submarines. Some 1200 flew with various air forces, including the Dutch Navy (Marine Luchtvaart Dienst aka MLD), which is my 'backyard'. The range of the Neptune, which was produced in many variants, was 5900 km at a cruising speed of some 600 km/h (using the 2 Westinghouse J34 jet engines next to the 2 Wright R-3350 piston engines !). Another former USAF transport: N97KC (c/n 17000) is a Boeing Stratotanker and flew with the USAF as 53-0218. What a year 1953 was: production in full swing of the Fairchild C-119, Boeing Stratocruiser, Douglas C-124 Globemaster, Lockheed Constellation, Convair C-131 Samaritan, Douglas C-118 (DC-6) Liftmaster.... ! 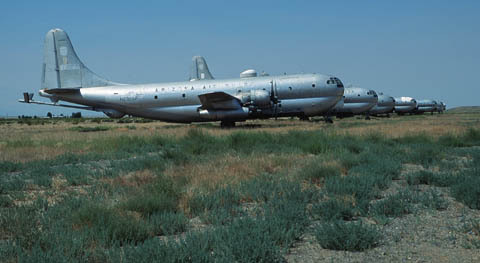 The C-97(Model 367) was named Stratofreighter or Stratotanker; the commercial version (Model 377) was called Stratocruiser. At one time it served as a roadside restaurant, "The Flight 97 Restaurant" in McMinnville, Oregon. They brought it back to airworthiness and flew it to Greybull. Only to be stored again. When I took this shot I did not think this aircraft would fly anymore, but it did ! In november 2000 it flew to Minneapolis/St.Paul in Minnesota to become part of the Minnesota Air Guard Museum. I don't think it will be kept in airworthy condition, though. 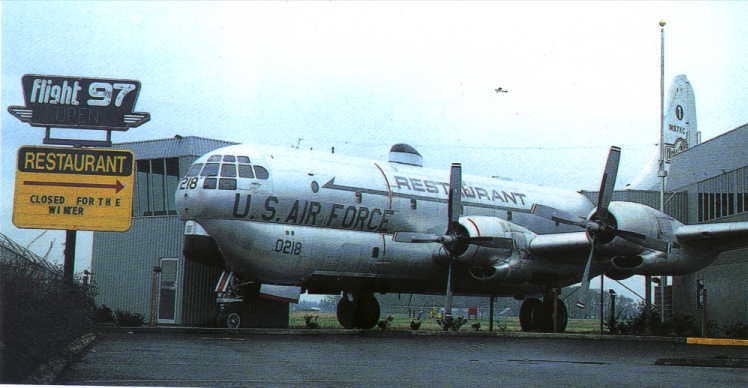 Here is an external link (use your "Back"-button to get back here) Minnesota Air Guard Museum C-97 and they have a photo of the "restaurant days" too !! (for a quick look, click here). 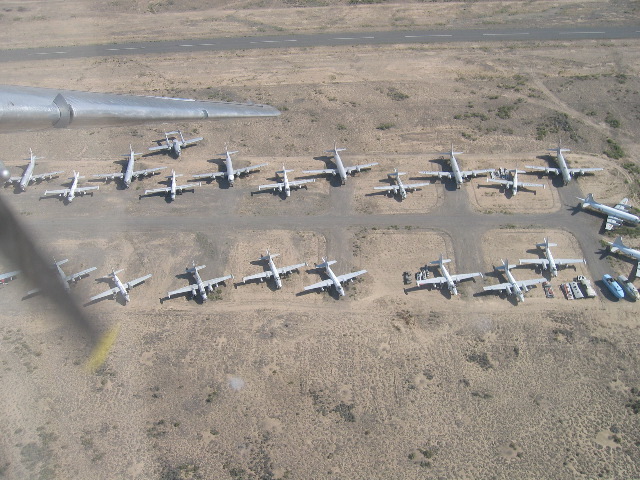 While H & P only operated 1 Strat, they show quite a few for spare here, parked in the desert ! Boeing took the lower fuselage (and the wings) of the Boeing B-29 bomber and redesigned the upper fuselage and thus came the Boeing C-97 into being. The USAF intended to transport tanks, howitzer guns, 2.5 ton trucks, etc with this one and needed volume in the upper lobe of the fuselage. The standard powerplant became Pratt & Whitney R-4360 Wasp Major engines, rated 3.500 hp. 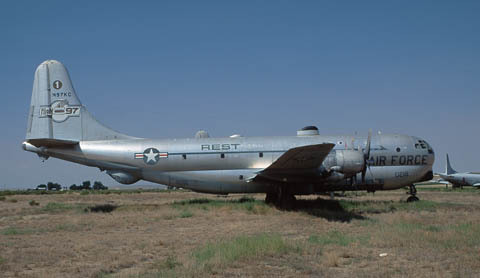 But later these Stratofreighters (widely in use with the Air National Guard) were refitted with extra General Electric J47-GE-25 jet engines.This was because it was slow compared to most and since it was decided to convert them into tankers (KC-97 Stratotankers), it had to match the speed of the planes on the receiving end ! It was the last piston-engined plane built by Boeing. As Boeing 377 it became quite successful with civil operators (first flown in 1947). Pan American was the first to accept the Stratocruiser. To name some other operators: British Overseas Airways Corporation, Northwest Airlines, American Overseas Airlines and United Air Lines. Ed Eggert wrote me in Apr.2006: "We went everywhere in them in the 1950s in SAC. Non-stop from MacDill to the west coast of the US was commonplace. That nice cherry glow of the collector ring was a comfort. Of course when the flight engineer elected to change power settings it usually woke most of us up! As you already know this airplane really had to strain to be a refueling platform for our B-47's, though it did serve its purpose. I was surprised to learn that Boeing did not consider it a commercial success in civilian form." Old SAC rat, retired in Florida,USA. 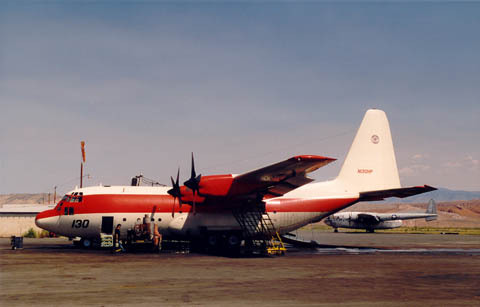 C-119G 53-8150 (c/n 253) was entered in the FAA Register as N37636 for Hawkins & Powers. 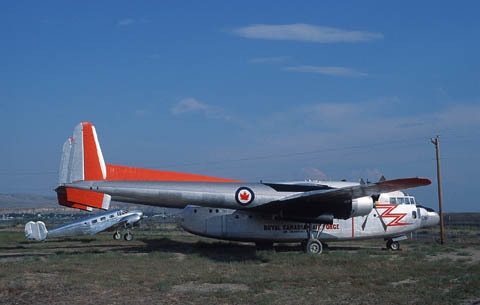 H&P specialises in airtankers and the Fairchild C-119 Flying Boxcar (a nickname by the crews, that stuck and later became officially accepted) was a bit underpowered for this task. So on this one there was probably never an attempt to convert it to an airtanker, but it could help as a spares supply to other aircraft in use and now it sits on the ramp as part of a rather basic museum. The Flying Boxcar was used with the USAF for transport, medical evacuation, para drops and as a gunship ("Shadow" or "Stinger") in Vietnam. It was also delivered to the US Navy, US Marines and air forces of Brazil, Canada, Ethiopia, India, Taiwan and South Vietnam. 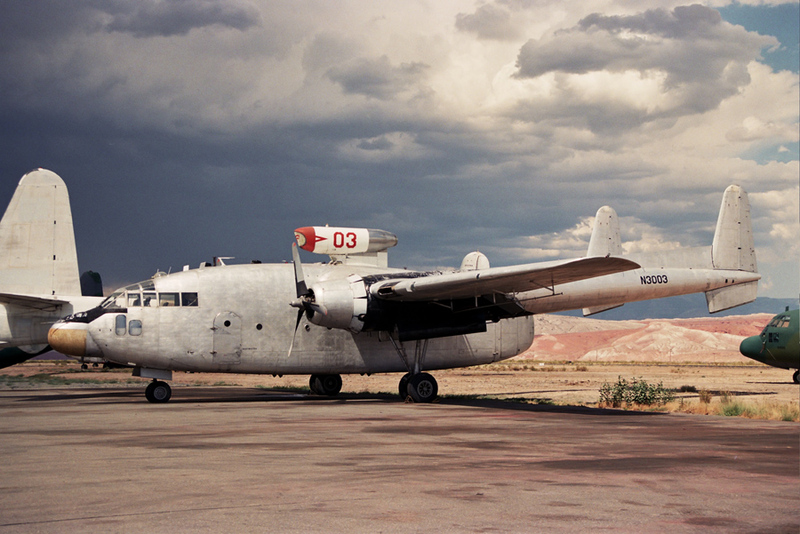 Another Fairchild C-119 Flying Boxcar, but the identity is a mystery to me. The paintjob and titles on the fuselage make this a former Royal Canadian Air Force example. On the nose vaguely 06 can be seen. Anyone with the identity of this aircraft ? 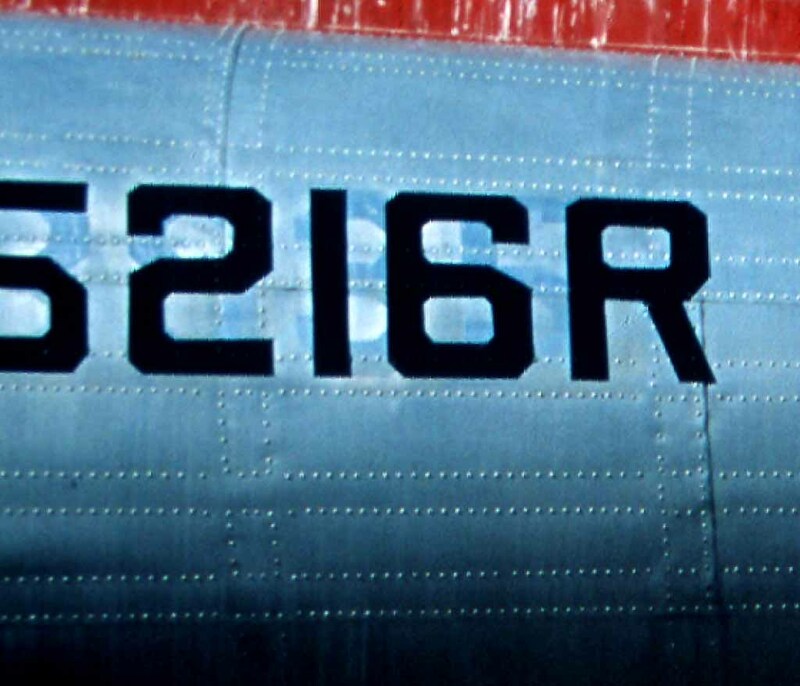 For a larger picture, click Mystery C-119. It was parked across the runway and since Hawkins & Powers are the only users of this airport, it was sufficient for me to look right and left before I could walk across the runway ! Walt Redmond wrote me in Sep.2005: I have been to Greybull four times - '79, '89, '98, and '99. I shot every large aircraft on the field during my '89 and '98 visits. Your two mystery "06"s I have seen too. I took slides of both of them on 21Aug98. What is maddening, though, is that the real RCAF 22106 was there on both my '89 and '98 stopovers. That was c/n 10737, sprayer N3003 "03". Is this the same aircraft: in May 2003 ? Seems that way, but '06' marking is now gone. "22106 has a contruction number plate which shows it to be c/n 10830. 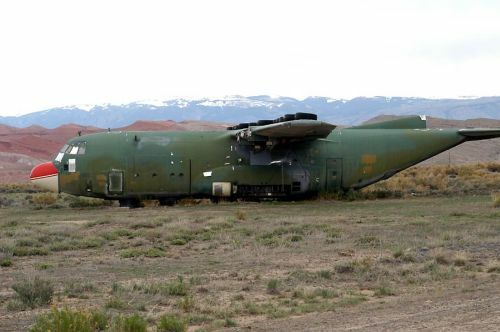 Of this manufacturer's serial, 10830, it has always been stated that this belonged to the USMC C-119 131663, which crashed in 1953! However the link between 131663 and c/n 10830 is merely based on a continued count of the production batches (batch 131662 - 131719 is c/n 10829 - 10904) and the math dictated 131663 had to be c/n 10830. But this has never been proven and most likely is an incorrect assumption. 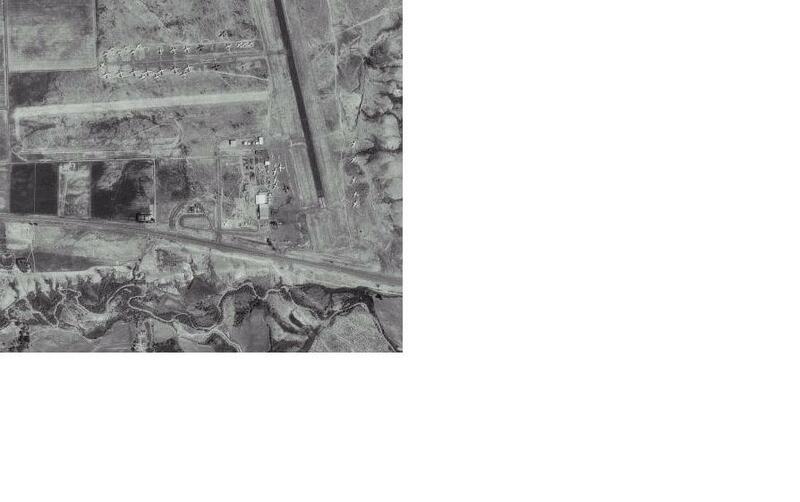 So RCAF 22106 is c/n 10830, what c/n belongs to 131663 is as yet a mystery." "Strangely, ADU Software shows the Museum piece as being 131706, c/n 10891. That would be next to impossible given the state of it in your Namibia/Kenya piece on 'Flight of the Phoenix'. It is on the Kevin Widdowson list on your site as well, which would explain why it is in ADU since Kevin was involved with them at the time of his visit. Perhaps it was assumed at the time?" See 131706 in 1982 and why it cannot be at KGEY! "I flew C97 N97HP out of King Salmon in 1981. We were hauling fresh salmon from there to Anchorage. The next year I flew a C-119 from King Salmon,AK - making round trip three or four times a day to the beach at Igegik. We were hauling salmon to load the C97s at King Salmon. Flew PB4Y out of Lancaster,CA in 1983 on fire fighting jobs." "What do you know about H&P C-119s N3003 and N3003? Now there's a real mystery...! In company with others, I clambered all around Greybull in August 1989, photographing everything. This is typical for me because as you know (a la Datang Shan) I am having all my older photos progressively digitised and I have just had the Greybull ones done. I have a good side on shot of a unpainted whole a/c N3003 (with a red and white jet pod with the #03) and in another photo of the line up of almost whole, but derelict unconverted ex RCAF a/c there is one also crudely marked N3003 (below) - with no obvious id visible!." This is probably all to do with making an aircraft whole for swapping with the USAFM in return for C-130s!" 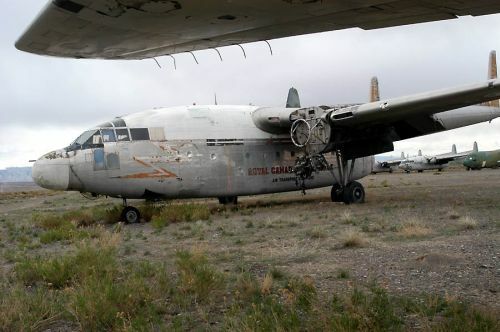 UPDATE: the derelict N3003/'03' c/n 10737 is still (2018) stored at KGEY (ex/ RCAF 22016), while the other one made its way to the Hill AFB Museum in Utah, and is c/n 10738 (ex/ RCAF 22107), preserved as '52-2107' - current in 2018. Here's another one.... it too has 06 on the nose ! Maybe it's not relevant to the RCAF serial ? This one is parked at the entry of the H&P office building, wouldn't you like to have one of these in your front garden or would the wife object ? Please email me, if you think you can identify this one. Over a number of years I have written and sent emails to H&P for identification of certain aircraft but was always ignored. Later I learned that staff was told to keep stumm to any such inquiries. This has led me to believe H&P wanted to hide the fact they swapped parts around or how they maintained their aircaft in isolated Greybull. Both, the C-119 ' 06' and the bare metal Beech 18, enjoy a prolonged existence as photos of Oct.2013 show on my page Greybull Log Report. For a further update see my visit in Oct.2014 (but alas no solution to the identification). Rick Patton sent me an update in 2015, I created a page of the pics he sent me over a period of some 15 years: HERE.. The real N5216R sits as Tanker 137 at a disused museum at Battle Mountain,NV. For the identity of this Tanker 136 (H&P moved parts around on these aircraft like there was no tomorrow) I have Cyril Defever to thank as he noticed on a slide of mine (which we traded) that there was a registration visible under Tanker 136's tailnumber: N3935 ! 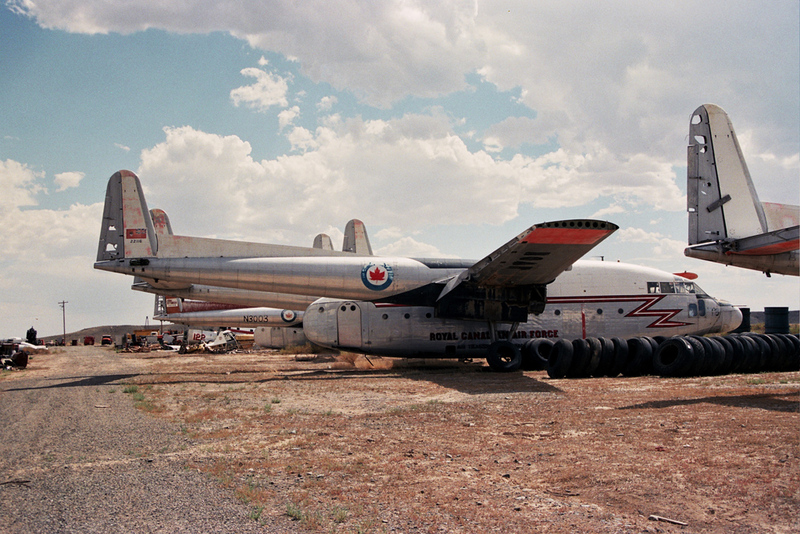 So this is C-119G c/n 10824 (ex RCAF 22113). Walt Redmond wrote me in Sep.2005:"I've been to Greybull four times - '79, '89, '98, and '99. I shot every large aircraft on the field during my '89 and '98 visits. The museum N5216R T136 I saw in '98 is indeed c/n 10824 N3935. Although they added a radome to the aircraft that I had photographed in '89!" 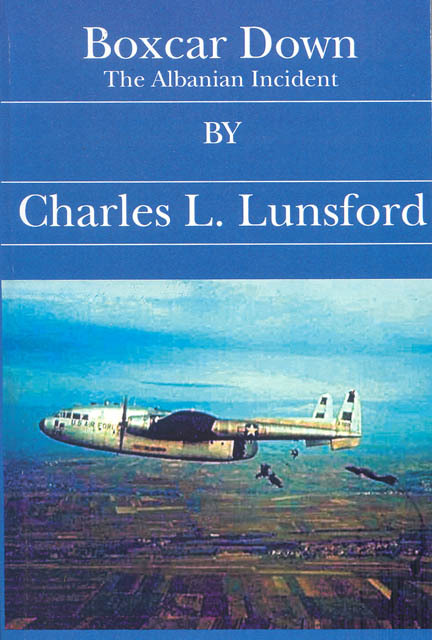 "The C-119's you show were used as tankers. In addition to the Wright 3350 radial engines, H&P installed a J-34 (or J-35, I'm not sure which) from a P2V-7 Neptune on top of the center section of the fuselage. 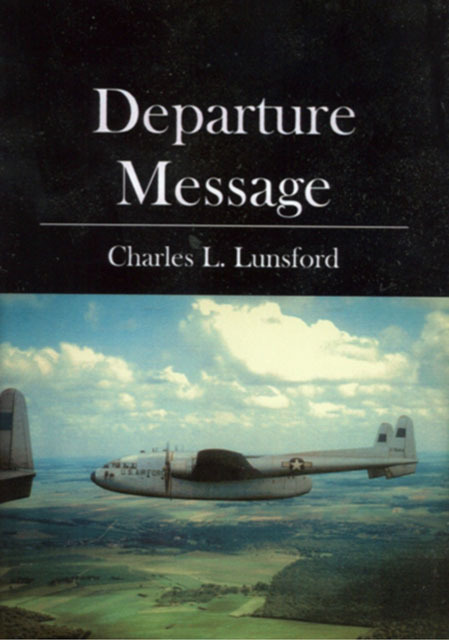 It burned the same Avgas the reciprocating engines used, and was started prior to a drop. We had eight or ten of these aircraft when I was flying for H&P (1974 7 1975), and did the jet pod modification in house, as well." 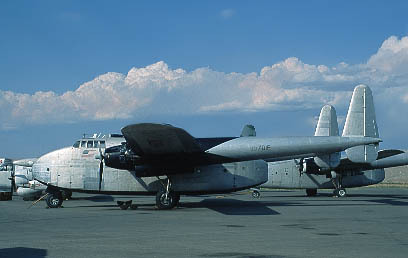 This Fairchild C-82 Packet was a forerunner of the C-119 Flying Boxcar. Production was initiated in 1944 and all 219 except 2 were produced by Fairchild (the other 2 by North American). It was used as a troop transport, medical evacuation and glider towing. Production was completed in 1948. It had a crew of 5, cruising speed of 190 mph (304 km/h) and a range of almost 700 kms. N9701F was used by TWA in the 1960s, to ferry engines around Europe. It is seen here included with the museum on H&P's ramp. In an attempt to solve the mysteries, I have compiled a list of various logs and hope people will contribute info that will lead to all registrations accounted with a construction number, click HERE !. 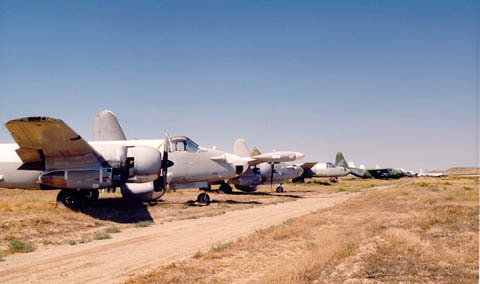 Ralph Pettersen sent me some photos taken in May 2003 of (un)identified airframes at Greybull. WOODLAND HILLS, Calif.--(BUSINESS WIRE)--Nov. 18, 2005--Great American Group, one of the nation's leading asset management firms, announced that it has begun conducting a complete liquidation of one of the nation's oldest and leading aerial firefighting and vintage aircraft operators. 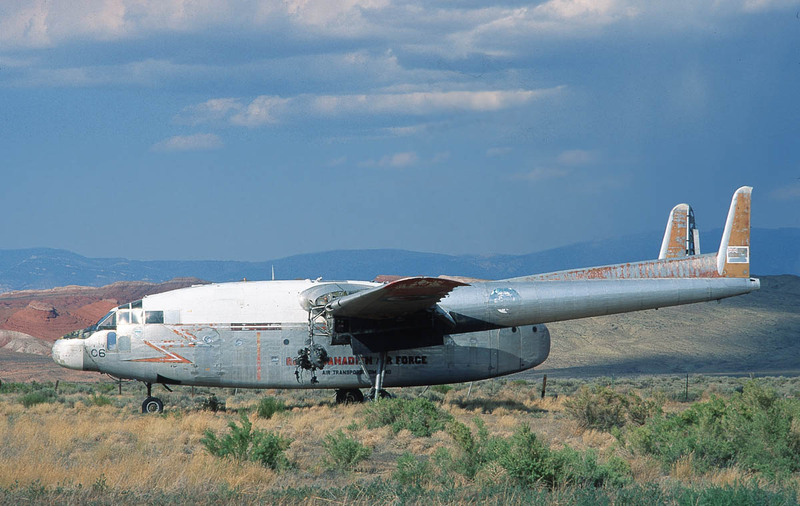 More than 60 vintage planes and aerial firefighting aircraft belonging to Hawkins & Powers Aviation, Inc., of Greybull, WY, are up for sale by Great American. 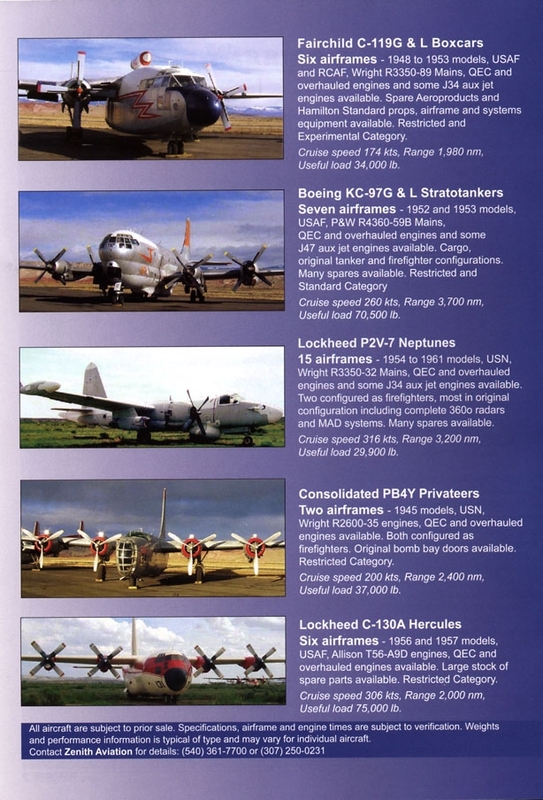 Among the millions of dollars in assets are fixed wing aircraft (including Lockheed C130As, Boeing KC-97s, Consolidated PB-4Ys, Fairchild C119s, a Fairchild C82 and a Fairchild F27, one Lockheed L-18, one DouglasA-26, and a Cessna T210, a Cessna 310 and a Cessna 340A), rotor-wing aircraft (including Bell Helicopter models 206 and UH-1B, a Kaman M43 and a Lama SA315B), and assorted aerial firefighting and ground support equipment such as fuel trucks, maintenance equipment and retardant tanks. Complete hanger facilities also are for sale. More on HP's inventory and fate of most of the aircraft on my Greybull's Log Report page, including a number of images of the newly established 'aerial firefighting aviation museum'. "We are greatly interested in any information on Campbell Airstrip, in Anchorage, Alaska, that your readers may have. The strip was built as a supplemental airstrip during WW2 and had a fairly large tent city during those years. We don't know what if any aircraft were actual on site (rather than at Elmendorf AFB). The tract now has a recreational trail, named P38, on the old east side taxiway, as a memorial to the war years. It is used exclusively by dog mushers during the winter. The tract was transferred to BLM who had support aircraft and water bombers on site during the 1960's - 1980's, until these functions were moved to Fairbanks. 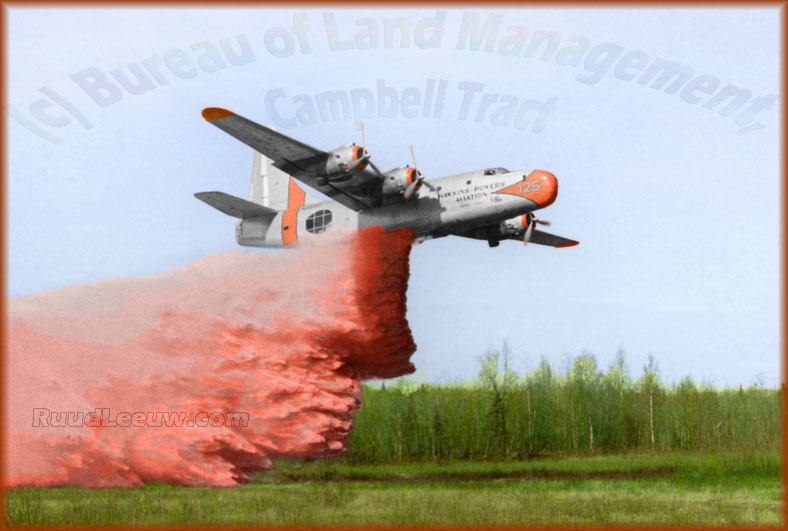 Smoke jumpers were based here for a while and the Campbell Creek Science Center is built in one of their Drop Zones. The airstrip proper is still active. 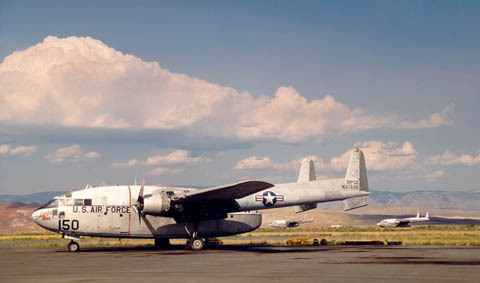 Here's the USAF Museum's file on the C-119 'Flying Boxcar'.